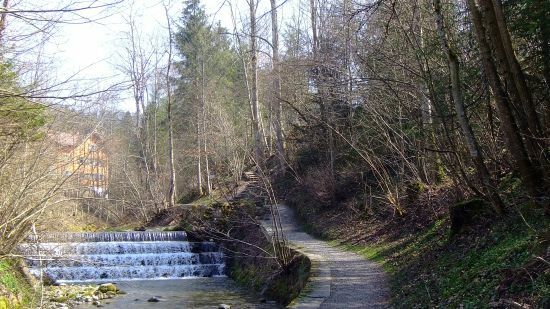 The Hausbachklamm near Weiler-Simmerberg, Bernd’s home town. It is my sad duty to inform you that on March 25, exactly 11 years after his father, 4 days after his 51st birthday, my colleague, partner, soulmate and best friend Bernd passed away, suddenly and unexpected. I’m in the process of recollecting myself and at the moment I can’t carry on taking care of this blog. I hope to get back to it some time in the future, as he always said working on this project made me noticeably happy. This post is also available in Italian, translated by Marzia Loddo. Dear Angela, I am deeply sorry to hear of your loss. My thoughts and prayers are with you and your family during this difficult time. I’m so sorry to hear this. For now, look after yourself; but I do hope that, in due course, you’ll feel able to start writing again. In the meantime, we’ll miss you. Sorry to hear this. Take time to take care of yourself. I hope you’ll find your writing drive again at some point: this has been both a great resource and an enjoyable reading. I’m so sorry for your loss. My deepest condolences. Please take care. I’m so very sorry for your loss, Angela. The entire registrar community is thinking of you. Sending you warm wishes from over here. Dear Angela, I join your friends and colleagues in sending my thoughts and condolences to you and your family. Angela, I am so sorry for your loss. I hope the pain eases soon. My colleagues and I at the National Postal Museum are so sorry to hear of your loss. We will be thinking of you during this difficult time. Angela, I’m so sorry for your loss. My thoughts and prayers are with you. I am so very sorry for your loss. I can only image what you must going through right now. May his memory be eternal. Angela, you have my deepest sympathy at this time of loss. You will be in my thoughts. May good memories of your time together keep Bernd with you always. Thank you for what you share with us. We are so sorry for your loss. Our thoughts are with you at this very sad time. I’m sorry to hear of your loss. You have friends all around the world who will be thinking of you. Angela, I am so sorry to hear of this. I will be thinking about you a lot in the coming weeks. So very sorry to hear Angela – sending love and hugs from Australia. I am very sorry to read this Angela. You’ll be in my thoughts. I am so sorry to hear this news. Please take as much time as you need, but do come back. THe contribution you make with this blog is indeed great. I’m so sorry for your loss. Take care. …Will be thinking of you during your time away. Condolences. Dear Angela – I am so sorry. Take your time, don’t hurry, and eventually things will start to feel better. Oh, Angela. May you find the strength you need during such a difficult time. May your family and good friends be constant in their support, and may your loving memories always remain in your heart. I am so very sorry for your loss. May you find peace. My condolences on your loss, Angela. I look forward to hopefully reading your blog again in time and I will miss it in the meanwhile. Take care of yourself. I’m sorry for your loss. My heart goes out for you. Take all the time you need, your health and well being is of utmost importance. I feel very sorry for you. I wish you much strength to handle this difficult situation. Dear Angela, Please accept my deepest condolences on the loss of your dear loved one. My heart goes out to you and Bernd’s family and friends. Take care of yourself. We will all be here when you are ready or need us. Thank you and hope you will find the joy of writing again -it has been fun to read. Oh Angela so sorry to hear this. Take care of yourself first and foremost and soon you will feel ready to blog again.